Hi Gwyneth, Thank you for a lovely weekend tapping, I have really enjoyed it all, and I am looking forward to starting working on my case studies. I’d like to update you on the dog stuff! 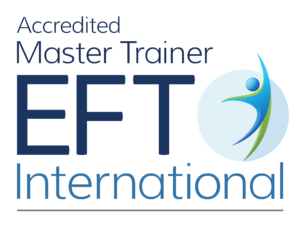 A couple of weeks ago I was doing some research about ‘EFT for Animals’ as I was thinking about coming on your course but wanted to find out more first as I was skeptical about the surrogate stuff. I came across your Interview Download with Karin and thought I would have a listen. Poppy my mad Collie was lying asleep. I had my laptop with ear phones and started to listen, Poppy snored on – dreaming of rabbits or something, all her little paws were moving and she was making little barks in her sleep I am sure she constantly dreams of the countryside where she spent her puppyhood. I decided to tap along with your interview with Karin and I got really into it when Karin was role playing her dog Tiki. In my head it was like the theatre I could see it all happening. Then all of a sudden to my surprise Poppy sat up and looked at me. It was like a look of appreciation, almost as if she said ‘thank goodness you’ve got the idea at last.’ She then came and sat with me and I carried on tapping. The next day I noticed a definitely calmer Poppy. She stopped rushing ahead of me and barking, and was more obedient, though she has other aspects. So wasn’t this strange! 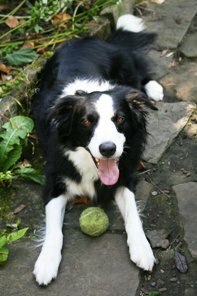 A surrogate network consisting of a woman in Skipton talking to a woman in Philadelphia about her dog and, without knowing it, helping a woman in Sheffield to help her dog Poppy in her living room. And after that even one of our neighbors commented on how much better Poppy was behaving. So then I came on your course and did some more work for Poppy. I phoned home that night and Tony said Yes, Poppy has been better. Even when the window cleaner came to the window she just had a bit of a woof and didn’t go mad like she used to. He said “but how could you do that you are in Ilkley and we are here in Sheffield about 50 miles away” I said: “lets not judge it lets just see what happens.” I came home to a much happier Poppy, an even more obedient Poppy. When I said “come away from windows” she would just turn her back and lay down. With the postman all I had to do was point and she ran the other way. Back at home I decided to do some Choices work with her. She was stood in the living room and I pretended to be her I said “even though I want to scratch at the carpet I choose to be calm” and she immediately flopped down on her side and went to sleep. Amazing! I decided to test out my fear of walking her too (Alison and I did some EFT work on this on the moors) and we went to the park. I noticed some aspects arising as I got to the park fence. By accident I dropped her ball as I stood at her gate and Poppy nosed it into the park (down hill). We had to follow it and we ended up having the funniest game of foot ball you have ever seen. Poppy was actually heading the ball when I threw it. She headed it around the field and into the goal posts and I laughed and laughed and laughed. I will have to video her it is so funny. She is here sleeping at the side of me right now: we’ve had a big day. I’m so looking forward to the future and trying more EFT with Animals. Who knows how it works, I just know that it does.